Chadian President Idriss Deby's son died of asphyxiation from chemicals released by a fire extinguisher. Officials were treating the death of Brahim Deby, 27, as a murder investigation, judicial officials said. His body was discovered Monday in the basement of his apartment building in Courbevoie, west of Paris. Authorities were ruling out the possibility that Deby, who had a criminal record, may have died accidentally, but said a head wound on Deby's body may not have been related to his death. Toxicology tests were planned, said an official from the prosecutor's office in Nanterre, west of the capital, on condition of anonymity because the case was continuing. Deby's body was found in a corridor between an underground parking lot and a flight of stairs in the apartment building. The prosecutor's office said he had apparently died violently. The Chadian leader was told of his son's death in Accra, Ghana, where he was attending the African Union summit, his communications office said, saying the news came as a "great shock" to him. He was not expected to make an announcement until further details were available from investigators. The spokesman said the president would not cut short his trip to Ghana, but stay through the end of the summit Tuesday. Brahim Deby was the president's oldest son and had no official government post, according to the Chadian president's office. He was convicted on drugs and weapons charges in June 2006. A Paris court handed him a suspended six-month jail sentence for possession of drugs and illegally carrying a weapon. The trial stemmed from Brahim Deby's involvement in a fight outside a nightclub in western Paris, during which a semiautomatic pistol fell from his pocket, judicial officials said. He had no authorization to carry a weapon, and the prosecution accused him of using a diplomatic suitcase to have the weapon delivered. During a search of his apartment, police discovered 375 grams of marijuana and 2 grams of cocaine, officials said. A poor central African nation, Chad shares a border with the violence-wracked Darfur region of Sudan. Conflict from the Darfur crisis has spilled over into eastern Chad. Chadian rebels also have challenged Idriss Deby, who first came to power himself at the head of rebel columns. Competition for power in Chad has intensified since it began exporting oil several year ago. 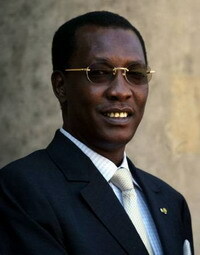 In 2006, Deby was re-elected to a third term as president. Critics contested the fairness of the elections, as well as those in 1996 and 2001. He faced only token opposition in last year's vote, which came just weeks after rebels, who include Deby's relatives, failed in a bid to capture the capital. The insurgents staged the attack from bases in the volatile region where Chad meets Darfur. Power has never changed hands at the ballot box in Chad. A 1990 takeover by Deby brought a semblance of peace after three decades of civil war and an invasion by Libya, but the president has become increasingly isolated in recent years.